We celebrated the Autumn equinox on the weekend, with a bit of a harvest party, and our woodfired pizzas of course! We had a lovely day with a great group of friends and family. The food was amazing, with most people bringing home grown and home made food (or both!). It was a lovely way to celebrate a time of year that was typically the time to bring in the harvest in preparation for the dark times. Here in Australia this time of year is still quite mild and the harvests will extend beyond the equinox. Our tomatoes are ALMOST ripe now!!!! Its been a funny growing season this one, with very early hot periods (that sent most people into a frenzy of 'what is summer going to be like' (me included), then it turned bitterly cold for a while, and then back to a typically mild summer (like the ones we used to have)). Despite this we have had a pretty good crop of beans (the purple king climbing beans have been great - definately will plant more of these in spring), reasonable crops of zuchinni (good for me anyway! ), potatoes and lots of very little carrots. We had a great crop of blackberries (all gone now though - the plants are dying back) and still inundated in big juicy apples. I think the last crop will be the chestnuts (there are about 10 wild chestnut trees nearby, so we will do a collection of these once they are ready), and then I think it will be pretty quiet till spring. 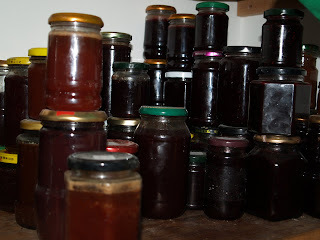 So what do we do with the abundant crops (especially the wild ones in our area) - well, I have gone somewhat overboard on the preserves I think!!! Brad suggested a table at our equinox celebration with 'please take one'!!!! Personally I think there is something comforting about a pantry full of jams, chutneys etc. It feels as though no matter what happens to this world and civilisation at least we wont starve. Perhaps its from the 'old days' when we had to preserve the crops so that we would survive winter before the spring crops begin bearing. I guess its not really relevant in todays world, as everything is available year round in the supermarkets, if its out of season its just imported from overseas or grown in a hot house. I find that growing your own and gleaning from the wild plants forces you to eat more in tune with the seasons. And I am happy to go straight past the jam, chutney, milk and eggs in the supermarket!!! So now we head into the dark, the days are noticably shorter, the shadows definately longer, and the nights colder. We are heading into unknown territory with regard to our power system (we installed it around the time of the spring equinox last year). So far it has performed perfectly, with an excess of power (typical for solar power) over summer, but once the sun drops lower in the sky we may not make enough power to keep the batteries charged enough. The sun sits pretty low in the sky up here, quite surprising to us, considering we lived only 30mins away and it was never so low at our old place. So for now we are planning on enjoying the light while it lasts, spening time in the garden, and getting fencing done (as well as the final jobs to keep us a bit warmer this winter). Soon it will be bitterly cold, and I have a backlog of fleeces to spin, so thats what I will be doing this winter!